Douglas Payne is the bassist of Scottish band Travis. In 2004 Dougie and Travis, contributed to the Band Aid 20 single Do They Know It’s Christmas? which also featured Neil Hannon. 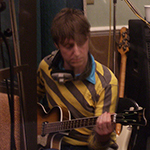 In 2005, Dougie contributed to the recording of Victory For The Comic Muse. The same year, Dougie had also recorded with Andy Dunlop, Miggy Barradas and Neil Hannon, the song ‘Vote Beeblebrox’ for Joby Tabot’s soundtrack of The Hitchhiker’s Guide To The Galaxy. The movie also stars Dougie’s wife, actress Kelly Macdonald.